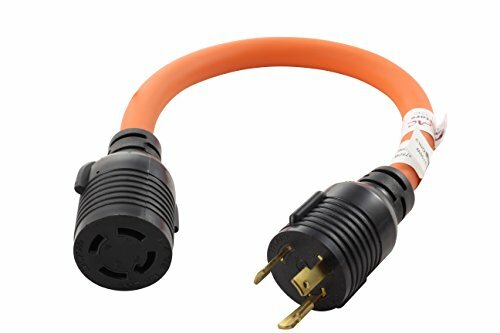 Generator Pigtail Adapter Cord. NEMA L5-30P 3Prong 30Amp 125Volt Locking Male Plug to NEMA L14-30R(Hots bridged) 30Amp 125/250Volt 4Prong Locking Female Connector. Max Power: 3750W. 1.5FT STW 10/3 30Amp Wire Anti-Cold Weather Cord which stays flexible in Cold Weather. STW 10/3 Anti-Cold Weather Cord which stays flexible in Cold Weather.